The Landmark is situated on the highest point on the small mountain, Azlef, 2 km south of the town. Locals call it "Qalb" - "qaalib al-sukar " meaning Sugar Cone or Loaf of sugar. It can be seen at the southern horisont as a pillar just above the trees. It is rather easy to reach by walking in it´s direction from Diabat or from Essaouira. It´s about 2.3 km up hills trough the forest and sandhills and you always find paths to follow. 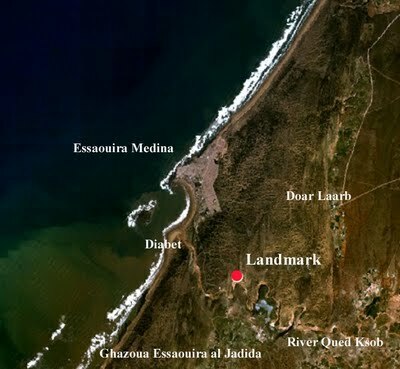 There is a track to Diabat - 2,2 km easy walk. For mountainbike easy - moderate grade. Standing there you have a 360° view . To the west and north you see the village Diabat, the Island of Mogador , the Atlantic ocean and the Medina of Essaouira. North of the town you see the seaboard road to Safi. To the south you see Ghazoua, the new town of Essaouira and the river Oued Ksob. East you see Dour Al Arab and the road to Marrakech. and is in a good condition. About 10 meters high. for the realization of the first network of triangulation of southern Morocco, to the establishment of the regular mapping Moroccan cadastre and land registration. There was Lt. Aubry who was responsible for observations and the creation of this point. 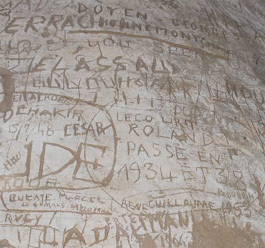 You can see graffiti all over it, even at the top, so high that the writer must have used his friends as a ladder to reach.